The field of grocery delivery services is rapidly diversifying - with everyone from Amazon to Google competing to go to market for you. Doing your own grocery shopping is so old school. It's practically an antiquated custom reserved for those who have the rarest of all commodities these days - free time. Or at least that's the way it appears in light of the rapidly expanding field of grocery delivery services. Everyone from the world's most popular Internet search engine (yes, Google) to America's largest grocer, along with a gaggle of small start-ups, are vying to do your grocery shopping. The field is becoming so crowded right now, it's almost hard to keep up. "The latest list is about 57 venture backed delivery services - everything from Next Organics, to Good Eggs," says Shen Tong, founder of Food-X, an accelerator program focused on launching food-related ventures. He rattles off the names of so many such companies it's dizzying. "It's not a fad anymore. It's a real trend." "There's all kinds of players," Tong continues. "The farmer-centric delivery services, and the pure organic concept. And Amazon Fresh. There's all these different forces, it's a groundswell." In addition to those Shen mentioned, the market includes the recent addition of Walmart and Google Express, which join a field that includes longstanding and well-established players like FreshDirect and PeaPod (a company that dates all the way back to 1989, as hard as that is to believe). Somewhere in the middle are companies like Instacart, a grocery delivery service launched in 2012, and Amazon Fresh which began raising its profile in 2013. And then there are even trendier or more exclusive services like Hello Fresh and Blue Apron, both of which deliver pre-measured ingredients and chef-created recipes so you don't even have to think about how to combine your groceries into a meal, further increasing the luxury of all of this. Yet none of these services are what Tong refers to as the true game changers. That title he reserves for the super CSAs, or Community Supported Agriculture programs. For those not familiar with the CSA model - it involves a farmer offering a certain number of shares to the public. 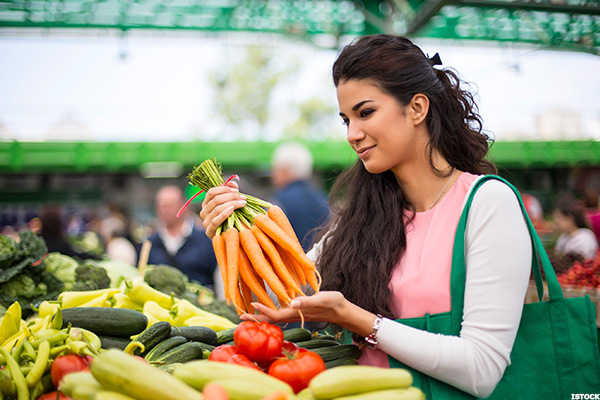 Typically the share consists of a box of vegetables, but other fresh grown farm offerings may be included. Consumers purchase a share, subscription or membership and receive deliveries of seasonal goods each week from the farm. "You subscribe to farms that deliver produce directly to your door," Shen explains. "It has been around for about two decades, but now it's taking off big time. I refer to it as CSA 2.0 - this is like a farmer's market, but it's a super farmer's market." The upshot of the many grocery and food delivery services in Tong's mind is that they're providing a dramatically different alternative when it comes to eating, one that celebrates nature and farmers and chefs, as opposed to processed food. What's more, there seems to be a market for nearly all of the models. Tong says grocery and food delivery companies are rapidly finding market share and revenue these days. "When you look at the space, FreshDirect, one of our main partners, took 13 to 14 years to get to a half-million dollars in revenue," says Tong. "And for the newer kits it took just three to five years." Walmart's Ravi Jariwala says the grocery giant's personal shopping service is finding increasing success with each new market it enters. Just a few months ago, the company announced it would offer a grocery drive-up service in about 20 markets around the U.S. And it will continue to expand that service in the coming year. 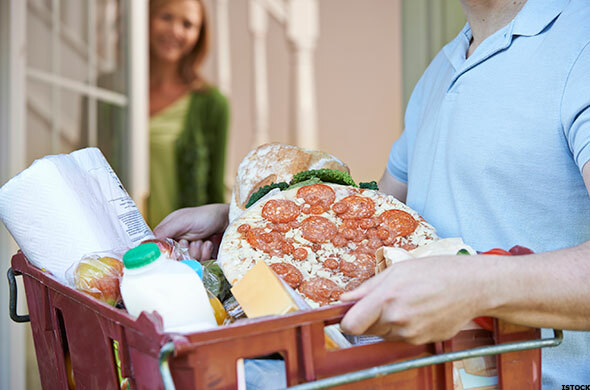 Taking an approach slightly different than grocery delivery, Walmart's model involves placing your grocery order online and then driving to the store to pick it up at the front door - eliminating the need to actually do the shopping yourself. "There's a lot of different players trying to serve customers their groceries," Jariwala says. "Walmart, as the nation's largest grocer, viewed this service as a way to combine our digital and physical assets in a way that makes shopping quicker and easier." The service is free and allows customers to pick up their orders whenever it is convenient for them. Walmart associates load the food into the customer's car. "We hear from moms all the time, who tell us that what used to take them two hours or more, between packing up the kids and getting the kids in and out of car seats, is now being done in a matter of moments," adds Jariwala. "We're just making it easier for moms and dads and consumers around the country." What's more, groceries are really just a small fraction of the burgeoning high-tech shopping and delivery market spawned by the Uber approach to life. There are sites, apps and companies offering to do everything from pick up your dry cleaning to delivering alcohol and sending a masseuse to your home, says Toffer Grant, CEO and founder of PEX Card, a company that developed a prepaid credit card that is now used by many of the shoppers employed by delivery companies. The bigger story really is about technology geeks wanting to deliver everything and anything to you, if logistically they can make it happen, says Grant. "First and foremost, many of these companies build themselves as logistics companies," says Grant. "So if there's a way to move something, whether it's a burrito or flat screen television, if there's a way to get someone to a location to pick it up and deliver it to another location more efficiently because there's an algorithm for it, they will do it. That's the app economy. Uber is the granddaddy that everyone focuses on. But for every one of these various categories of products and services, there are multiple players joining in. Uber decided you could use a Smartphone to order a car service and that got a lot of other people thinking about what else you can order using your phone, and that's how industry got started." And in such a mind-bendingly diverse marketplace, Google is able to cross the threshold from being just in our virtual world, to the physical world, says Grant. But does all of this spell doomsday for the old fashioned brick and mortar grocery stores and our traditional way of shopping? Some analysts predict that this newly emerging food economy, one they liken to the early days of the Internet, will put immense pressure on local grocery stores, forcing them to downsize or rethink how they do things and reduce the types of foods they continue to offer, in order to remain competitive. "On some level what everyone is competing for a share of the stomach," says, Keith Anderson, VP of strategy and insights for Profitero, a company that provides e-commerce competitive monitoring for retailers and brands. "I think the real risk for the traditional retailers is that food consumption is changing from scratch cooking after a traditional trip to supermarket, to these pre-configured meal kits that a Blue Apron sends you. When you look at the cost per person of that option, it's a pretty competitive price point...And for theMmillennial who never learned to cook and maybe never will, this meal assembly trend is on target. They don't need to think about anything, the meal is all taken care of for them." Others, however, say there will always be a desire to do some shopping on your own, to go pick out those fresh apples or inspect the tomatoes and have a conversation with the cashier, who you've grown to know so well. "There is this notion that people like to go and shop and see the food they're going to buy," says Grant. "People like to go shop, because it's part of what they grew up with, going shopping with mom or dad. And you still have generations of people who have no idea what an iPhone can do and they expect to go grocery shopping. I think it's a shift that's going to take time. It won't be abrupt."